In preparation for the New Moon in Cancer I went to an herb shop to purchase supplies for a ritual. I was instantly drawn to a small, brown dried plant that resembled a tumble weed. I held it in my hand and felt it calling me. 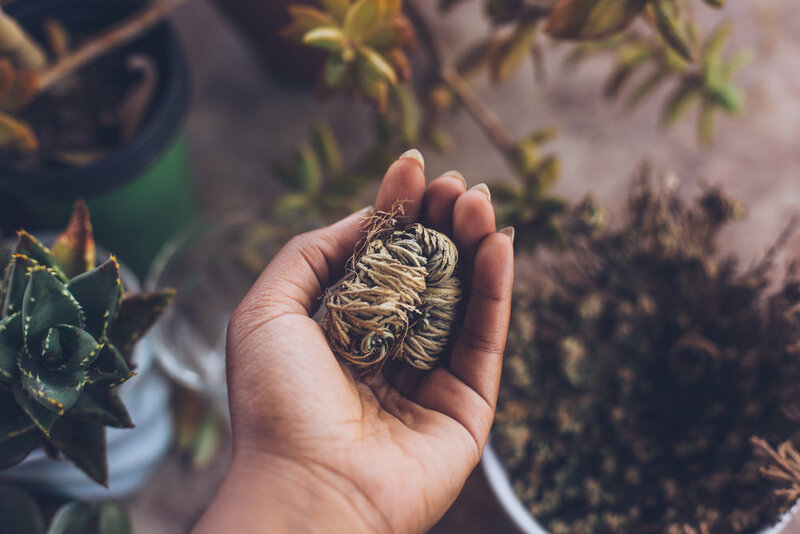 This plant is called the Rose of Jericho, also known as the Resurrection Plant. Native to the deserts of Mexico, this plant is able survive years without water by shriveling up its leaves inside itself. When reactivated by water, this plant produces a beautiful green bloom that opens up and lays flat. The metaphor of death and rebirth that this plant possesses is a powerful lesson that I am in the process of learning. 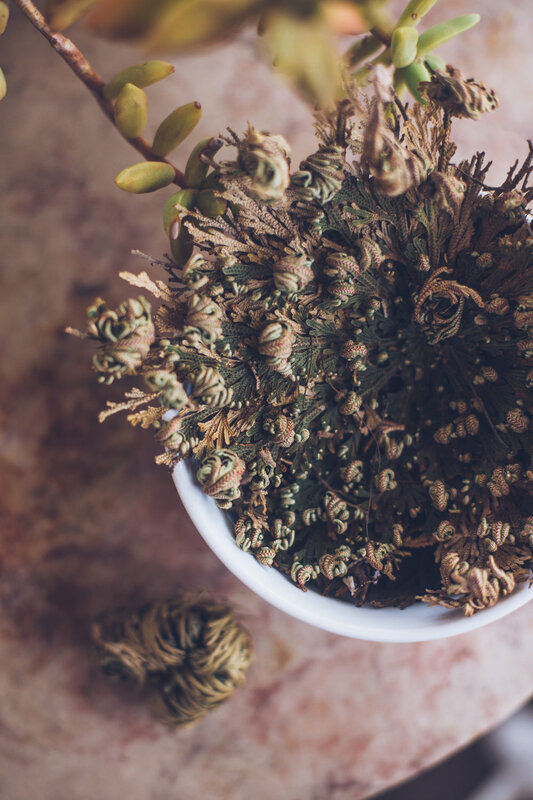 Rose of Jericho has taught me the beauty of transformation and healing. Seeing this plant, whose exterior is closed off and seemingly void of life, transform before my eyes into a fragrant green plant has allowed me to see the potential of rebirth in all living things. When confronted with trauma, I go into a state of hibernation in order to protect the parts of myself that are most vulnerable. This protects me from further harm and allows me the space to lick my wounds, but I let myself get get stuck in this state. I stayed closed off from the world, allowing myself to believe that there would only be more pain if I opened up. I stayed in the desert for a year, never allowing the love from others to penetrate my shell. It was only when I began to pour into myself that I started to soak up affirmation through my roots. I learned that when the threat of danger has passed and I’m in an environment where I can heal, the work begins. The drop of water that allowed me to bloom was self-care and affirmation. There is a misconception that you can never truly heal from trauma, only process it though therapy. Rose of Jericho has taught me otherwise.While verbal processing is a valuable part of the healing process, it is only one component. Addressing the spiritual, emotional and physical remnants of trauma is the key to truly healing from it. This plant goes through the trauma of death, of starvation, of abandonment and neglect and is able to return to its beautifully abundant form with water and care. In the same way this plant resurrects itself, we can resurrect ourselves too. We innately have the ability to heal within us, it just has to be nourished and allowed to grow. In 2019, discover how to use the rhythms and cycles of the moon with the Astrological moon calendar by timing your personal growth and manifestations to the power of the waxing and waning moon. Are you interested in deepening your connection with yourself through astrology? Download a FREE 2019 moon calendar here!